Indonesia's Famous Tourist Attractions in the World - I will be attempting to write four popular tourist spot in the world from Indonesia. So what are the popular Indonesian tourist spot in the world? tekenal tourist attractions in the world who are the first in Indonesia is Bali, bali tidsak doubt is vacation destination that provides all the facilities are complete. maybe if we're talking national scale then the name of Bali will be your first choice. Bali is a major tourist destination in Indonesia, as Bali has everything needed by the local and foreign tourists, from cultural tourism to the state of nature is very beautiful as the beach, mountains and valleys retreat are all very well known to all corners of the world. 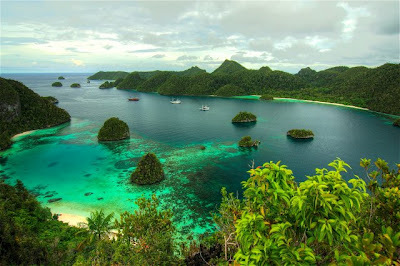 Islands are located west region of Papua Provindsi a marine library dunioa, where 75% of marine animals can be found scattered in duni underwater Raja Ampat archipelago. Lombok to further destinations after Bali, almost all travel service providers providing vacation packages with chili kebali as additional alternative tourist destination. This makes getting famous chili. It is located directly adjacent to make lombok bali bali subtle with. Not only chili also has a long coastline and beautiful, lombok bali also be an alternative to the overly crowded with natural beauty that is no less beautiful than Bali, Lombok provides a quiet atmosphere as something not to be found in Bali. Borobudur is the largest Buddhist temple in the world located in Magelang, Central Java. The temple is a heritage Buda has masuh as 7 Wonders of the world version of the UNESCO body established by the United Nations. Borobudur temple is a temple founded by the Mahayana Buddhists around the year 800 AD's during the reign of Sailendra dynasty.